This is probably one of the most important aspects to keep in mind when you are going to learn a language. Every person learns differently, especially when it comes to languages. Brains work differently too, so give your brain the chance to adapt but learn how to adapt to your own brain as well and try not to have too high expectations or do not set the bar too high in the beginning. 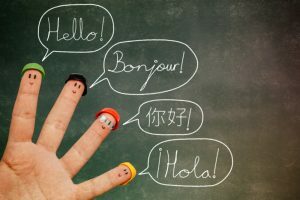 You will discover that, for example, you might learn better through repetition, writing new words down, or listening to someone who speaks their native language. Define if your learning style is rather visual, auditory or kinesthetic. A neat trick to know which group you belong to might be, for example: choosing a few words of the language you want to learn and read them several times. If you can still remember them the next day, you’re probably a visual learner. If you do not remember them, then have someone else read the words a few times without for you without looking at them. If you can remember them the next day, then you’re probably an auditory learner. If none of this works, then read and write the words, repeat them out loud, have someone read them and listen. Also, try to think of feelings and memories associated with the meaning of those words. If you can remember them the next day, then you’re probably a kinesthetic learner. If, for example, in the past, you have already learned a language, then review what you learned during that period of time and try to find out what it was that worked best for you. What, in your opinion, helped you learn or facilitated the learning process? What do you think did not help you at all etc.? Copyright © 2019 Dpgsulo.com. All Rights Reserved.